The chemical triclosan is used as an antimicrobial agent in more than 2000 consumer products, from toothpaste and cosmetics to kitchenware and toys. Studies in mice by a team of scientists in the U.S. and China have now linked short-term dietary exposure to triclosan with altered gut microbiota, colonic inflammation, worsening colitis, and colitis-associated colon cancer. The studies, reported in Science Translational Medicine, showed that dietary triclosan reduced the diversity and composition of gut bacteria, while tests in germ-free animals indicated that the gut microbiome was necessary for the detrimental effects of triclosan on the colon. Triclosan is used so widely and in such high volumes in the U.S. that just about the entire population is exposed to the chemical at almost every stage of life, the researchers report. Because most of the triclosan used in commercial applications is ultimately released to the environment, the chemical also represents a widespread contaminant, and is listed among the top 10 pollutants found in U.S. rivers. Previous studies have shown that triclosan can have toxic effects at high doses, but it’s not yet known how it might impact on health at levels encountered by the population on a daily basis. As a result, regulation of triclosan use in consumer products hasn't been particularly strong, the team adds. In 2016, the FDA did mandate removal of triclosan from over-the-counter handwashing products, but this was primarily because studies showed that its addition provided no benefit over and above that of plain soap. The UMass Amherst–led researchers have now investigated some of the potential effects of triclosan on colonic inflammation and associated cancer development through a series of studies in experimental mice. Initial tests showed that feeding mice with a diet containing 10 to 80 ppm of triclosan for three weeks resulted in low-grade colonic inflammation. (The amount of triclosan added to the diet generated blood levels of triclosan that are equivalent to those found in the plasma of humans exposed to triclosan in their everyday lives.) The experimental animals also exhibited increased levels of the proinflammatory cytokine interleukin-6 (IL-6). High- and low-dose dietary triclosan, in addition, caused worsening of colitis in a dextran sodium sulfate (DSS)-induced mouse model of inflammatory bowel disease (IBD). Exposure to triclosan was associated with reduced colon length, increased crypt damage in the colon, and increased infiltration of immune cells into the colon, as well as increased plasma concentrations of IL-6 and IL-6 gene expression in the colon. Dietary triclosan similarly led to worsening colitis in a spontaneous IBD mouse model, “which further validates its pro-IBD effect,” the researchers write. Further studies in an induced colon cancer mouse model indicated that exposure to the higher, 80-ppm level of triclosan in the diet caused the animals to develop larger and increased numbers of tumors, and increased expression of colon cancer–promoting genes, plasma levels of IL-6 and tumor necrosis factor–α (TNF-α), and TNF-α and IL-6 gene expression in the colon. 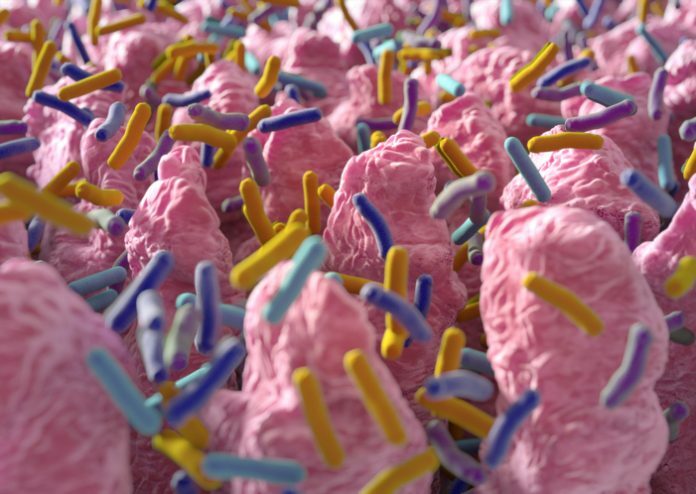 The researchers next showed that healthy mice exposed to dietary triclosan exhibited decreased gut microbiota diversity and altered composition of gut microbiota. “Notably, TCS [triclosan] treatment caused a ~75% reduction in the abundance of Bifidobacterium, which has been shown to have anti-inflammatory effects,” they note. Laboratory tests confirmed that triclosan inhibited growth of B. infantis in culture.“This suggests a potential direct effect of TCS on gut bacteria in vitro,” they write. When conventionally raised germ-free mice were fed an irradiated diet and treated with 80 ppm triclosan for three weeks, the conventionally raised animals developed low-grade colonic inflammation, associated with reduced colon length and upregulation of IL-6, similar to inflammation exhibited by experimental mice fed a normal, triclosan-containing diet. In contrast, triclosan had no effect on inflammation in the germ-free mice. “These results confirm that the gut microbiota contributes to the proinflammatory effect of triclosan in vivo,” the authors state. The authors comment that their findings point to the need for further studies to examine the effects of triclosan on human gut health and suggest that current guidelines on the widespread use of this antimicrobial may need reviewing. “Because this compound is so widely used, our study suggests that there is an urgent need to further evaluate the impact of triclosan exposure on gut health in preparation for the potential establishment of further regulatory policies,” notes Haixia Yang, Ph.D., co-lead author and a postdoctoral fellow in the Zhang laboratory. “…treatment with triclosan significantly increased disease development of IBD in the mice, suggesting that IBD patients may need to reduce exposure to this compound,” notes co-author Hang Xiao, Ph.D.